This is our charming living room. 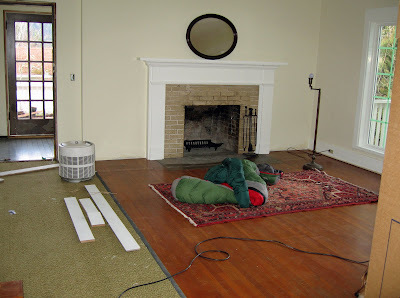 Well, I should say that this is the living room as we found it back in the summer of 2006. This is also a good first introduction to the 1970's decorating phenomenon that took this house by storm...paneling. North facing wall - the windows and door will be replaced. 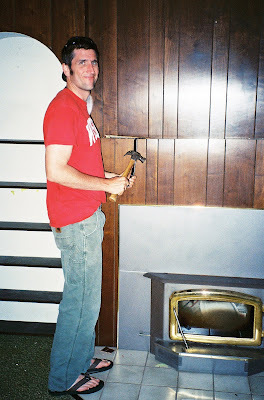 As you can see, we couldn't wait to tear down the paneling. 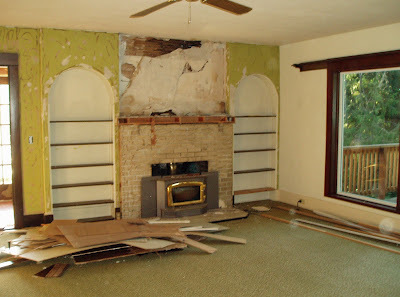 Upon doing so, we discovered the original brick fireplace, the original plaster walls (painted pea green to match the pea green carpet), and the remnants of an old roof leak that we were already aware of. We had to hire a professional chimney repairman to remove stove insert and to restore fireplace and chimney to working order. Thankfully, it was in good shape. 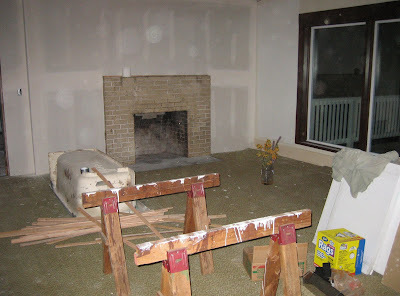 As you can see, we covered up the bookcases that were on either end of the fireplace. 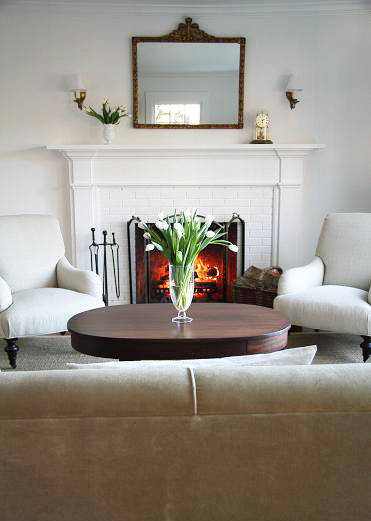 We did this because we wanted the fireplace to be the focal point of the room. Also, note in the photo above that the ceiling is exposed lathe. The plaster was removed and replaced with drywall. 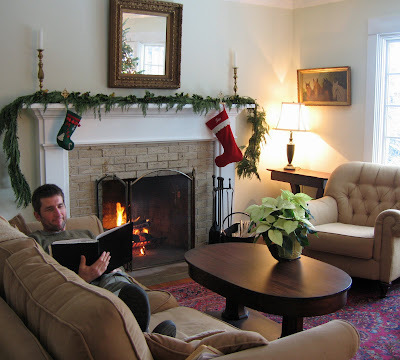 The local craftsman who built our kitchen cabinets, also helped us design and build our reproduction fireplace mantle. It took a great deal of restraint to not pull up the ugly green carpeting immediately but after six months of hard work, and with much more hard work ahead of us, we peeled some away to help keep us motivated. This is our Christmas 2006 miracle. After giving ourselves a move-in goal date of Christmas, our months of hard work finally paid off. 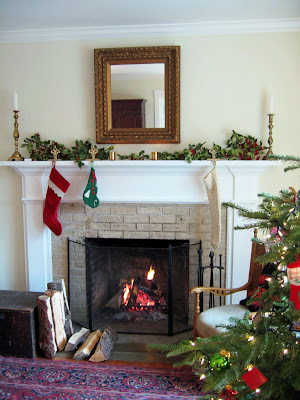 Moving into a house with twinkling lights, adorned mantle and a decorated tree ended up being a perfect first day in the house. And I mean that it was literally our first day sleeping in the house. By then, we had chalked up about five months of living in the small one room apartment over the barn, working day and night on the main house. This is Christmas one year later and new windows have been put in and the rest of the remodel has been completed.Can you tell how relieved hubby is? Left to do in living room: buy a fabulous new couch and chairs...more photos to come! Our new couch and chairs (Rowe Furniture) arrived just before Christmas of 2009. As you can see, we decided to brighten up the room with lighter furniture giving it a crisp, fresh look. Once we bought our new couch and chairs, the paint color we chose several years ago looked a bit dull. After trying out several swatches of different colors, we decided to go with white. We wanted the room to be as bright and crisp as possible (living in the Northwest, this is especially nice during the rainy months). I found a mirror that was a bit more proportionate to the mirror we had over the mantle before. I also found a great deal on some old brass sconces that add nice extra detail. 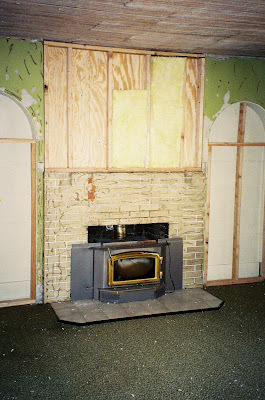 The brick fireplace was painted because it was not original to the house. We believe the blond bricks were installed (probably due to repair) sometime in the 70's. I really love the look of stone and brick so perhaps one day, we'll reface it with something that would be more period appropriate. As in previous years, it was nice to celebrate Christmas with our 'new' room. We had waited a long time (due to the expense of the remodel), to buy new furniture so it was a great addition to the Christmas festivities. Here are more pictures of Christmas 2009. 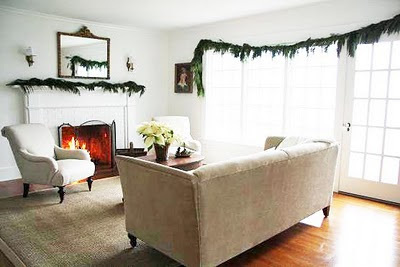 Below, are pictures of the living room after Christmas. what a transformation! it looks SO festive for christmas! okay, a couple of questions. 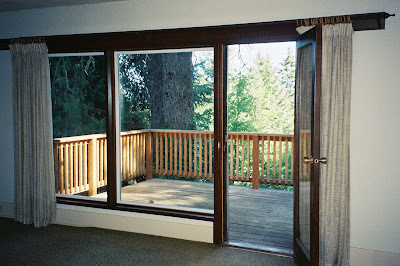 First, do you need window treatments, does it get cold in th winter w/o them? What color is on the walls and ceiling, it looks a lot like my colors in my living room. Also, I'm so jealous, we don't have a fireplace. sad face. Amazing. You must repost this as well! You've done an awesome job and with only two comments before me I realize that not many are getting to see your awesome work. wow, this is amazing! at first, i was thinking "no! keep the bookcases!" because i love built-ins in a house, but it turns out that you were right -- it was a good idea to get rid of the bookcases! and the whole room is gorgeous! fantastic job!! Oh, how I love the clean, simple, crispness of this room! I wonder if I could live with white? I may have to tone it down in stages. In your home, less really is more! Thank you for showing us around your home! I have just found your blog and am drooling. This living room is a DREAM. I have an cast iron wood stove in my living room. 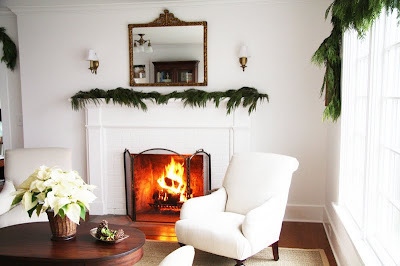 It is charming and cozy, but having always lived with fireplaces, I am having trouble envisioning how the decor should work around it. Have you seen any farmhouse rooms with woodstoves that you like? Was wondering where you got your couch? Love all the white! Everything looks perfect! You are so right: white is bright and gives light. You take wonderful pictures and your stories are a pleasure to read. That new mat is so practical as well as beautiful, it suits the room and furniture really well. I know how you feel to have achieved all that and can finally simply sit there looking at it. Thanks for this great blog. can i ask wher you got your beautiful coffe table from???? I found it in an antique store in Washington state. I had seen one in a magazine years before so had been keeping an eye out for one for some time. Great job! What a gorgeous bright space. Our living room is currently painted a dark red, which came with the house, and which I hate. I am so anxious to paint the walls white. 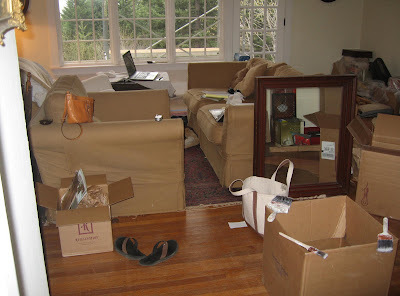 We are also hoping to replace the living room furniture soon - would love to know your source for the sofa and chairs. They look similar to designs I have seen in Restoration Hardware. Thank you for sharing - the before and afters are so inspiring! Both are by Rowe furniture! I am also madly in love with this coffee table. Does the style have name? Or perhaps, the unusual base might have a specific name? I am just wondering what terms I can search for it by on google. It's an antique library table. I saw one in a magazine years ago but they can be hard to come by. 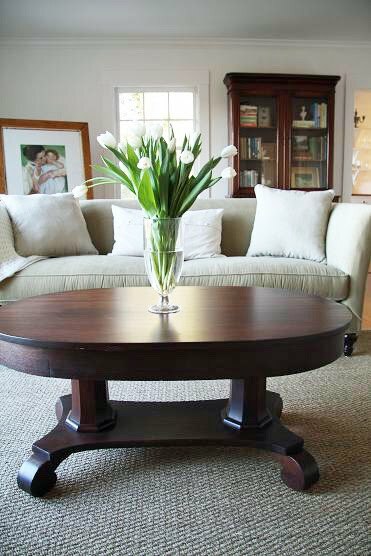 The short ones, like ours, were cut down when coffee tables first came into fashion (early 1900's probably). Originally, it was table height. Love your home! What color white did you use in your living room? It's perfect! We used Simply White by Benjamin Moore. The Ecospec line and in flat. Thank you so much for telling me the name of the paint you used! Thanks so much for replying with the paint color! Trina, thank you for letting me know about the table :) I plugged into google and came up with a few images like yours. I really appreciate it! gorgeous transformation, my hubby is building a house in the countryside back home and I am very much looking forward decorating it, so thanks for all the inspiration. I am just a beginner at doing home improvements and looking for inspiration to guide my decorating efforts. Thank you so much for your postings. I have the desire but very little creative know-how. I will be a regular visitor to your blog! Your home has me drooling. Love, love, love your approach to space and minimalsim. We are renovating a 1920's home built by my husband's immigrant Italian grandfather. The house is constructed of homemade blocks made of lime, sand, and concrete so I was amused when you talked about pre-drilling for pictures to be hung. Hanging pictures becomes an all day affair! Your blog is as clean and lovely as your home. I look forward to checking in from time to time to see what you have done. Thanks! Could you tell me where you got your rug? The rug pictured above is from Pottery Barn. It's a 9x10 seagrass. But it has been relocated to the dining room and a washed 12x18 jute rug from Home Decorator's is in its place. How are you enjoying the Rowe furniture? I love the look of the chairs and would like to use them in our very active living/tv/everything room. Are they comfortable and how is the fabric working out with little kids? We are very happy with the Rowe furniture we bought. The chairs are comfortable and have held up well. I've had to do some spot treatments (using just water) on chair a couple of times and it cleaned up completely. Fabric is working out well too! Thank you for the information. A local company in Portland has the chairs on sale for $599 plus they will upgrade to any fabric choice for that price. It looks like you might have linen on your chairs. Can you share the name of the fabric? Your home is absolutely stunning and such an inspiration! I came across your blog last fall while looking for inspiration for some home improvements works that we are doing to my grandparents' 1920s farmhouse, which I inherited last year. 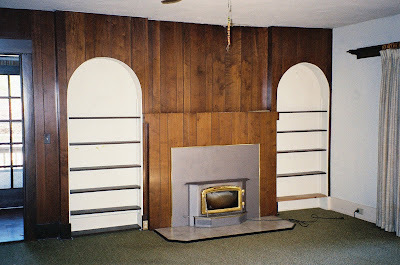 We are in the process of transforming an old coal burning fireplace into a wood burning one and the pictures of your living room fireplace caught my eye. Would you be willing to post the dimensions (both for the brick part and wood mantle) as I'd like to use similar dimensions for the reconfiguration. Let me get back to you on that! Mantle top is 90.5 inches wide. From floor to mantle top is 56 inches. The legs are 9.5 inches wide. the brick shows exactly twelve inches top and sides. Hope that helps! Super helpful. Thanks a mil! I have followed your blog for a while and have a quick question. 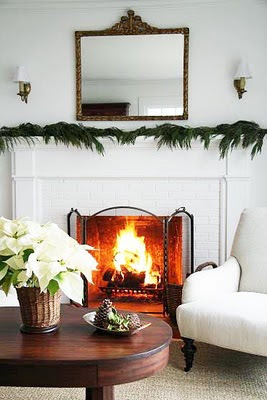 What material is used on the floor base of your fireplace? It is a slate of some sort? Thank you for the tip and any assistance you can provide. I love your fireplace screen! Is it an antique? I've searched online for something similar, but haven't had any luck. I looked everywhere for a simple antique brass screen and didn't have much luck at all. Especially for a reasonable price. I came across ours at Home Depot! I think it was about $40. I bought it several years ago so not sure if they're still available...perhaps try online too. The mantle was made by the cabinet maker who made our kitchen cabinets. Gorgeous home and so tastefully done. I am looking for a really faint shabby chic yellow. Do you still have the name of the original yellow you painted the walls in the entry and the living room? Thanks for sharing. I do not have the color. It was a linen beige and it was special mixed. I once inquired at the paint store what color it was but they didn't save the information. I would like to thank you for posting so many pictures on your blog. We have a 1890's farm that has been in my husbands family for over 100 years. We are almost finished with our formal living room. Would you mind telling me the name of the Rowe chairs and sofa that you purchased. They look like they would fit perfectly in the space that we have. I also like the idea of selecting my fabric. Love your blog; beautiful and inspiring pictures! 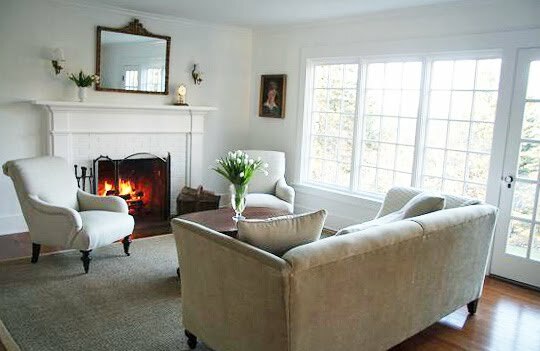 Wondering if you remember which white paints you used for your living room as I just bought a new house and would like to paint it white as well! Love your sense of style, Wil. Love your blog; beautiful and inspiring photos! 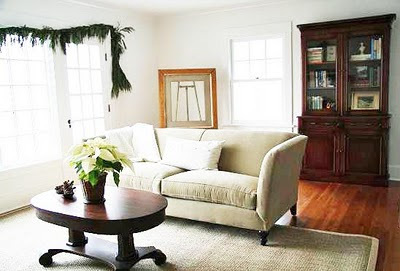 Wondering if you remember which whites you used for your living room as I just bought a house and would like to paint it white and I really like the tints you chose. Whoops! I see you used Simply White by Benjamin Moore... Did you use a different white tint for the crown molding and / or ceiling? Many thanks, Wil. Just found your paint info on your resource list. Thanks so much. I live in Canada and think I'll enjoy the same white on gloomy days! Thanks for your wonderful and inspiring pictures, Wil. Oh, I have paneling! I am painting it as I have no desire to live in a dark, brown cave. What was up in the 70s? Trim is 4 1/4 wide on side casing and 5 1/2 wide on head casing. We replicated the existing trim that was throughout the house. The narrow bead was cut down from larger pieces. I am so loving your beautiful home. The living room is breath taking. 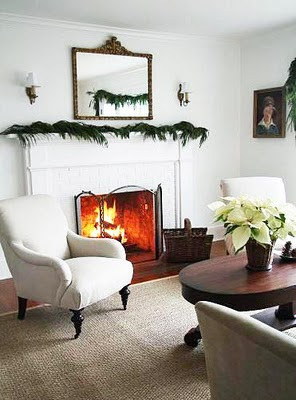 I am a big big fan of white and am using it in our dated1886 home. We have a wrap around porch that shades the house so the white really opens up the space. It's fresh and clean. I just came across your blog looking for side yard landscaping through google:) I'm so glad I did. I need to catch up on all the blog posts. What a beautiful home you have. Wow, no way could I keep a room looking that clean. I'm probably the only one to say this, but I think I like the old furniture and decorating better, after the remodel but before you went all white. 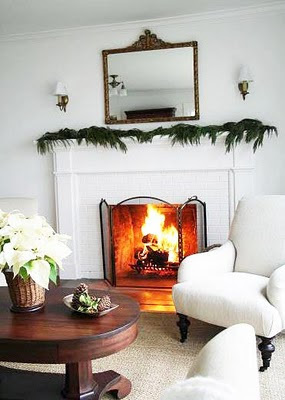 I really liked the exposed brick before it was painted, and the white mantel set it off so nicely. The neutral colors were so cozy. Of course, I live in Colorado, which gets a lot of sunlight, so we rarely need to brighten our homes. As long as the windows are open, we're doing pretty good. i haven't read through all of your posts to see if you had mentioned it ... what color of white did you paint in your living room? SO excited! I just found a coffee table that is almost identical to yours!! Mine, however, is in an unfinished condition where everything was stripped off. Did you refinish yours, or is it as found? As always, love seeing your beautiful home! Hello. Love your white living room. 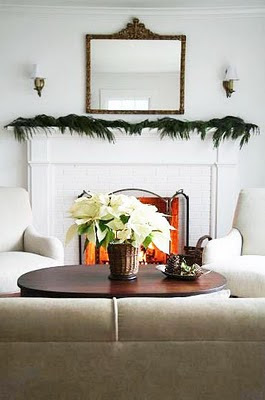 Could you tell us where you found the mirror over the mantel? Thanks!